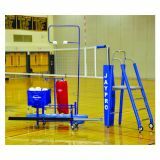 Package includes 3" Powerlite System (PVB-6500), Folding Referee Stand (VRS-6000) and Padding (VRS-60P), Single Net Keeper (VNK11), Hammock Drill Cart (HSVBC24), Cable/Buckle Covers (VCC-12), Volleyball Equipment carrier (EC-500) and The Spiker (TS612). Free lettering on upright padding (1 side of each pad). Specify pad color and lettering when ordering. 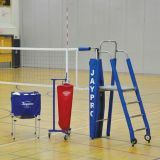 Package includes 3" Powerlite System (PVB-6500), Folding Referee Stand (VRS-6000) and Padding (VRS-60P), Single Net Keeper (VNK11), Hammock Drill Cart (HSVBC24) and Cable/Buckle Covers (VCC-12). Free lettering on upright padding (1 side of each pad). Specify pad color and lettering when ordering. Aluminum International Complete Volleyball System Including Uprights with Factory-Installed Adapter adjustable from 6'-8'2"
Simply the best world class volleyball net system available today! Jaypro's use of an exclusive internal gear system instead of a spring allows the height to be adjusted while the net is under tension! Designed for International, Collegiate and Advanced High School Level. Lightweight aluminum uprights with Infinite height adjustment range from 6' to 8' 2". Uprights are designed with a factory installed adapter to fit 3" floor sleeves. Uprights feature powder coated finish and durable recessed polymer pulley wheel. System meets NCAA, NFHS and USVBA specifications and come with a 10 year limited warranty on the uprights. System includes uprights with worm drive winch, patented Flex Net, upright padding and antennae. Floor sleeves sold separately. Specify pad color when ordering. PowerLite International Complete Volleyball System Including Aluminum Uprights with Infinite height adjustment from 6'-8'2"
Simply the best world class volleyball net system available today! Jaypro's use of an exclusive internal gear system instead of a spring allows the height to be adjusted while the net is under tension! Designed for International, Collegiate and Advanced High School Level. Lightweight aluminum uprights with Infinite height adjustment range from 6' to 8' 2". Uprights are designed to fit 3-1/2" floor sleeves. Uprights feature powder coated finish and durable recessed polymer pulley wheel. System meets NCAA, NFHS and USVBA specifications and come with a 10 year limited warranty on the uprights. System includes uprights with worm drive winch, patented Flex Net, upright padding and antennae. Floor sleeves sold separately. Specify pad color when ordering. Package includes 3-1/2" Powerlite System (PVB-7000), Folding Referee Stand (VRS-6000) and Padding (VRS-60P), Single Net Keeper (VNK11), Hammock Drill Cart (HSVBC24) and Cable/Buckle Covers (VCC-12). Free lettering on upright padding (1 side of each pad). Specify pad color and lettering when ordering. 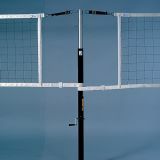 3" Powerlite Center package added to the 3" Powerlite System (PVB-6500) allows a two court set up using a common center pole. Package includes center pole, worm drive winch, Flex Net and upright pad. Specify pad color when ordering. 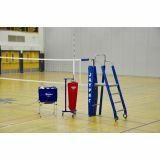 3-1/2" Powerlite Center package added to the 3" Powerlite System (PVB-7000) allows a two court set up using a common center pole. Package includes center pole, worm drive winch, Flex Net and upright pad. Specify pad color when ordering. Designed for International, Collegiate and Advanced High School Level. Lightweight aluminum uprights with Infinite height adjustment range from 6' to 8' 2". Jaypro's use of an exclusive internal gear system instead of a spring allows the height to be adjusted while the net is under tension! Uprights are designed to fit 3-1/2" floor sleeves. Uprights feature powder coated finish and durable recessed polymer pulley wheel. Meets NCAA, NFHS and USVBA specifications and come with a 10 year limited warranty on the uprights. Includes worm drive winch. Designed for International, Collegiate and Advanced High School Level. Lightweight aluminum uprights with Infinite height adjustment range from 6' to 8' 2". Jaypro's use of an exclusive internal gear system instead of a spring allows the height to be adjusted while the net is under tension! Uprights are designed with a factory installed adapter to fit 3" floor sleeves. Uprights feature powder coated finish and durable recessed polymer pulley wheel. 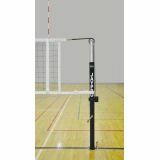 Meets NCAA, NFHS and USVBA specifications and come with a 10 year limited warranty on the uprights. Includes worm drive winch.